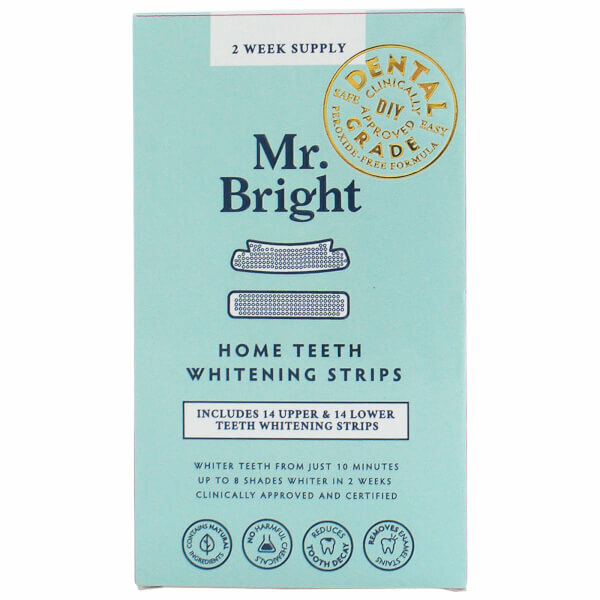 Achieve a bright white smile with the Mr. Bright Whitening Strips, a 14-day teeth whitening treatment that reveals visibly whiter teeth from just 10 minutes, and up to eight shades whiter in two weeks. 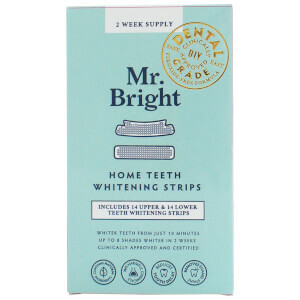 Free from hydrogen peroxide, which can irritate gums, the clinically approved and certified teeth whitening strips are infused with Glycerine, Sodium Bicarbonate and Cranberry to deliver whitening agents deep into the enamel for fast, effective and visible results. Helping to dissolve plaque and encourage optimum penetration of whitening ingredients, the strips will leave teeth looking bright and pearly (when used as directed). Also contains Organic Peppermint Oil and Aloe Vera to help freshen the breath. Free from hydrogen peroxide and GMO. Vegan-friendly. Not tested on animals.